I used my favourite snowflake shape from Uniko's Stunning Snowflakes. I love that there are 3 sizes so you can build up a blizzard! Everything on here is embossed either in clear or a coloured ep. I stamped the Savvy sentiment in Versafine Onyx, then embossed in clear. Then I stamped the white snowflakes in Versamark and embossed in clear. Then I stamped a couple more, embossed with Turquoise, stamped a couple more, embossed in Green. etc., etc. This panel was probably heated about 8 or 9 times and I found it interesting that after the initial couple of times, it warped. But after that, as I kept heating it, it flattened out again. I think I just bit my tongue... this is FABULOUS! Just amazing! Wow....CAS Fans, you are in for a TREAT !!!!!!!!!!!!! I love this, Ardyth! 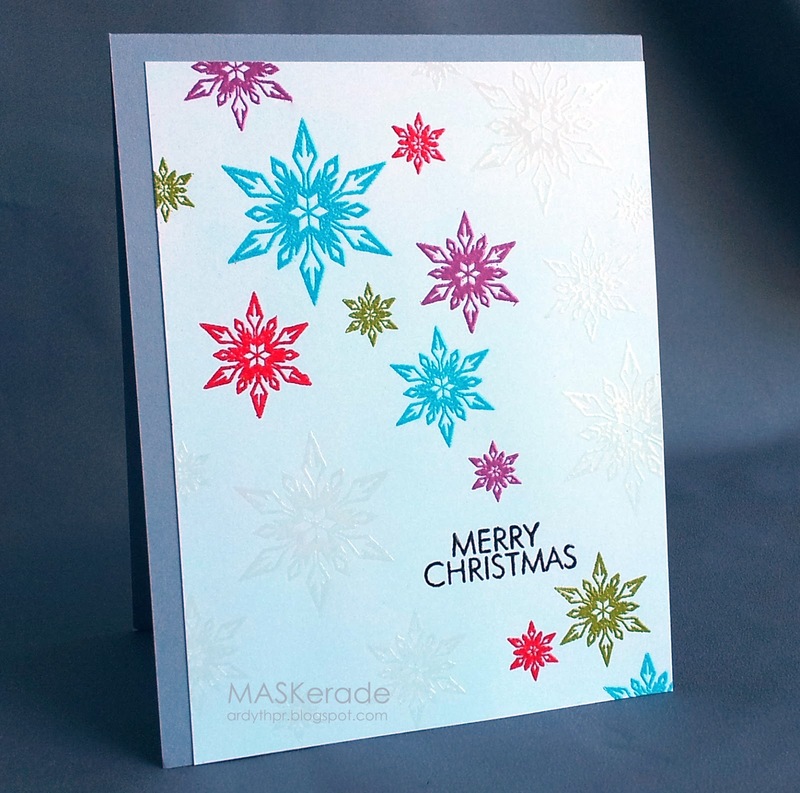 The embossed snowflakes look stunning against the Smoky Slate card base! Great interpretation of the Pinterest Pic too! Stunning interpretation of the Pinterest photo. I love the gorgeous embossing. awesome work here! Love the colors and the layout. This beauty just punted the previous #1 Favorite Ardyth card out of top spot! Interesting tidbit on the paper straightening out. That is one beautiful stamp! Love all the colours and the design and glad that it straightened! These snowflakes really are stunning! I love all the great colors you chose and how they seem to be falling from the sky! Another gorgeous card, Ardyth! Ardyth, I love your brightly stamped snowflakes. Awesome inspiration photo. Thanks for playing along with us at CAS-ual Fridays! This is drop dead gorgeous. And, yes--I'd say it is working for me. The colors, the placement--everything is just perfect. How fun is this card?! The colorful snowflakes are wonderful. Oooooh lovely! Thanks for joining us at CAS-ual Fridays!